The dusty parking lot stands out on Seaport Boulevard like the only kid who wasn’t invited to the construction party. All around it stand hulking steel skeletons that will soon become sleek office towers, hotels or apartment towers that promise to bring new residents, diners and workers. 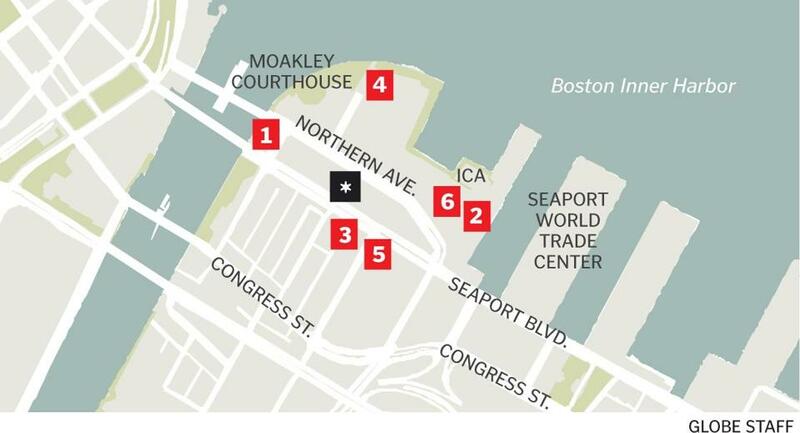 But on Friday, that old dusty lot across from the Joseph Moakley US Courthouse will join the party in a very big way. Developers will formally start construction on a $600 million pair of towers, one of the city’s largest mixed-use projects in decades. When completed in summer 2017, One Seaport Square will include 832 apartments and about 30 new stores, restaurants, and entertainment venues, giving the fast-growing Innovation District the retail destination that it sorely lacks. The 250,000 square feet of retail space in the development will be anchored by a Showplace Icon movie theater, a Kings bowling alley and entertainment complex, and an Equinox fitness center. Those tenants were announced at a ground-breaking celebration Friday attended by Mayor Martin J. Walsh and Governor-elect Charlie Baker. The 1.5-million-square-foot project will add to a recent explosion of development in the Innovation District, where an influx of new companies and residents have transformed a place that once served as parking lot for workers in the adjacent Financial District. One Seaport Square will be contained in two glass and metal towers rising to 20 and 22 stories between Seaport Boulevard and Northern Avenue. The buildings, designed by Elkus Manfredi Architects, will be ringed with retail space spread across the first three floors of the complex. The project is being developed by Boston Global Investors, WS Development and Berkshire Group. Its apartments will add to a dramatic increase in rental residences in the Innovation District and across the city. In the area around One Seaport Square, two large apartment towers were completed earlier this year on A Street and Congress Street. Three more are under construction, including a 21-story tower by The Hanover Company at Pier 4. Developers of One Seaport Square said they are confident there will be plenty of demand to fill the complex. The units will range in size from 365-square-foot studios to 1,335-square-foot three bedroom apartments. 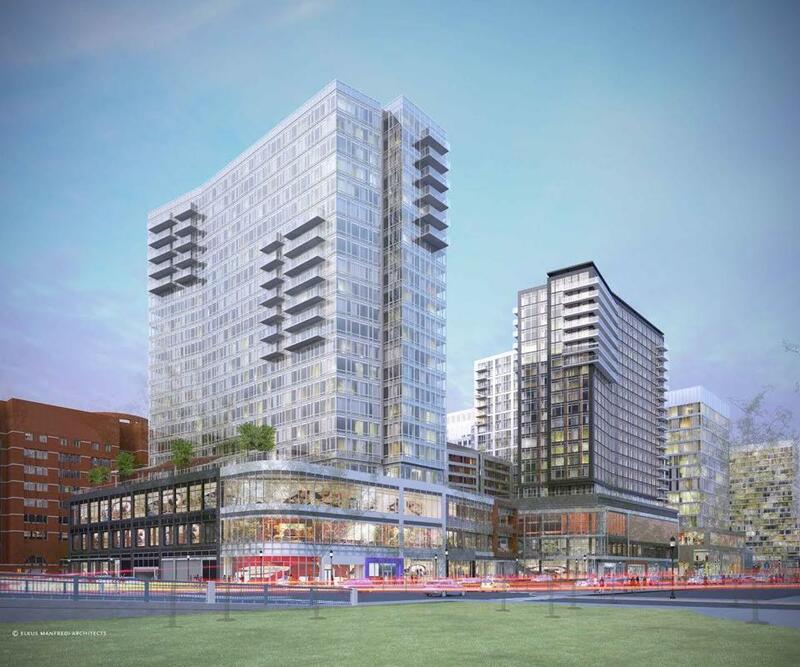 Executives with Berkshire Group said the project will include 775 parking spaces, a 17,000 square-foot public park between the buildings, and large communal terraces for residents. The developers will designate 96 apartments in the complex for moderate- to low-income renters. The complex will have the highest concentration of retail space of any development in the Innovation District, which still lacks a grocery store, let alone retailers that could draw people from outside the city. The retail space will not be designed in the style of a traditional mall, where shoppers walk off the street into a corridor filled with stores. Instead, each store will be accessible from the street, a design meant to encourage more activity on Seaport Boulevard and Northern Avenue. Construction of the complex will create about 3,000 jobs, with another 1,300 jobs expected to be created by the residences and retail businesses. Annual property taxes from the site will increase from $2 million to $8 million.